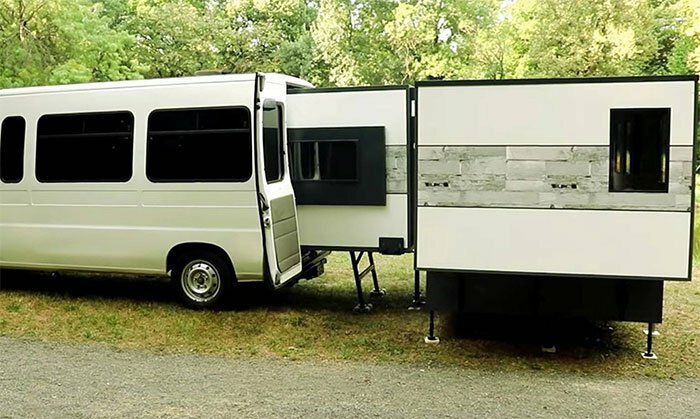 ioCamper expandable apartment house fits in the back of your van. There have been numerous attempts to create transportable apartments. Various models of motorhomes have been designed and they have enjoyed different levels of acceptance. However, none of the existing transportable apartment models is as daring as the ioCamper, the latest innovation that is set to change the face of transportable apartments. What makes the ioCamper different? There are so many elements that make the ioCamper better than other transportable apartments. The space and comfort it offers readily come to mind. The ioCamper is designed to be compact and expandable. It can expand to about four times the original cargo size of a standard van, thus giving you more space than you’ll get from any other transportable apartment model. All you have to do is load the ioCamper on your van and you’re sure you have a home with you. This saves you a huge fortune, as transforming your regular van into a motorhome is usually very expensive. Another striking feature of the ioCamper is that it is 100% automated. You do not need manpower to help offload the cargo as you can do that from your smartphone or any other WiFi-enabled device. Offloading, expansion, closure, and reloading can all be controlled from your smartphone. Kitchen- hot plates, sink, fridge, kitchen storage. What else can I use the camper for? Even if you do not fancy camping or long road trips, there are still a number of ways through which you can make use of the ioCamper. The camper would serve well as a standalone home in the courtyard and a fishing bungalow, among other possibilities. You could also use the ioCamper as an extra guest house when you have many guests but do not have enough space in your home. When can we start buying the camper? The ioCamper is still in the prototype phase. A crowdfunding campaign has been launched on Indiegogo in order to generate funding for the project. The expandable technology is already patented and the manufacturer projects that serial production would commence by June 2019. The target for the crowdfunding campaign is $200,000.